BC : Peace River Co.
July 06, 1989, LG Crabo. 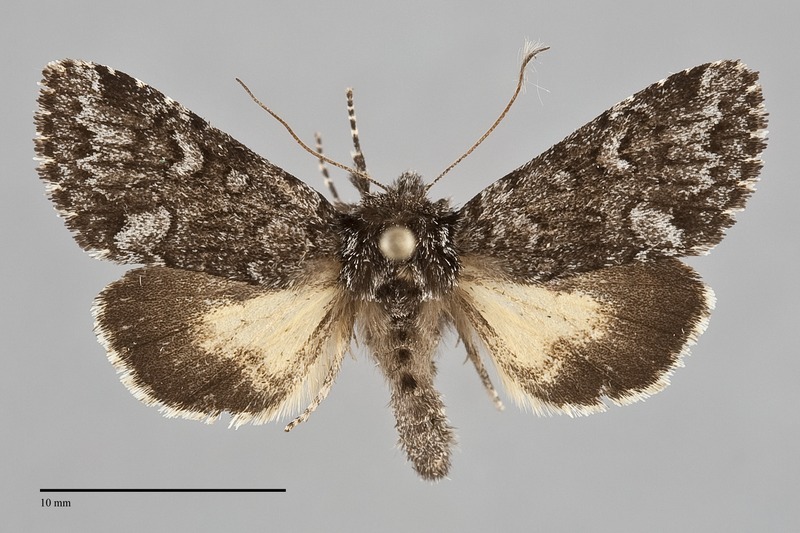 Lasionycta secedens is a small to medium-sized noctuid moth (FW length 12 - 15 mm) with powdery dark and medium gray forewings and yellow and black hindwings that flies in boreal forests in British Columbia in our region. The forewing is charcoal gray with slightly lighter medium gray basal to the antemedial line and in the subterminal area. The lines and spots are similar black. The antemedial line is slightly irregular and the postmedial line is smoothly scalloped between the veins. The median line is absent or very faint. The subterminal line is irregular, evident as a series of black spots near the outer margin. The orbicular spot is small and round. The reniform spot is heart-shaped. The claviform spot is small to elongate. The orbicular and reniform spots are filled with the medium gray of the wing base and subterminal area; the claviform is filled with the same gray as the other spots or the darker ground color. The hindwing is light yellow with a dark gray marginal band that continues to the wing base along the costal margin. The discal spot is fused to the anterior dark margin. A faint postmedial line is evident near the posterior wing margin in a few individuals. The head and thorax are hoary dark gray. The male antenna is weakly beaded, nearly filiform. This species can usually be recognized by the dark gray forewing with a pattern of simple dark lines and medium gray color in combination with a yellow and black hindwing. It is most similar in general color and pattern to Coranarta luteola and Coranarta macrostigma, two other northern species, but both have white in the reniform which is lacking in L. secedens. Within Lasionycta this species resembles Lasionycta leucocycla albertensis which has a light yellow hindwing. Unlike L. secedens this species has the black marginal band confined to the outer margin. The populations of this species are arranged in two subspecies. 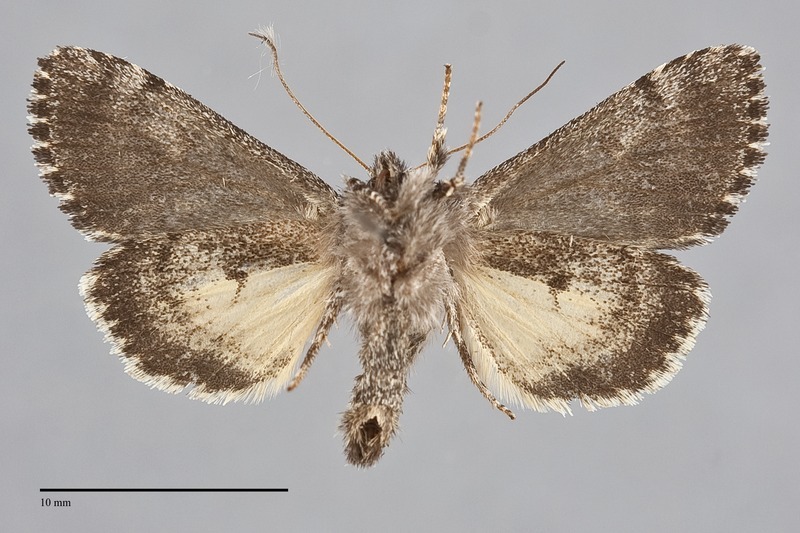 The nominate subspecies has contrasting dark and lighter gray colors on the forewing. It occurs in most of northern North America except in Yukon Territory. 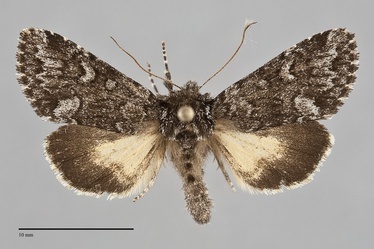 There it is replaced by subspecies L. s. bohemani which is more uniform gray on the forewing and has a narrower marginal band on the hindwing. This species is widely distributed across both northern Eurasia and North America in boggy taiga forests, and appears to favor spruce bogs in North America. Lasionycta secedens is widely distributed in northern and central British Columbia. It has been collected as far south as the vicinity of Green Lake north of Clinton. Lasionycta secedens is nearly exclusively a Canadian species in North America. It occurs in nearly the entire forested portion of the country from central Yukon Territory to Labrador and Newfoundland. The only known localities in the United States are from northern Minnesota where it has been collected by Kyle Johnson. This species may be a foodplant specialist feeding on Vaccinium vitis-idaea in the Ericaceae, but is polyphagous when reared in captivity. Adults fly during the summer and have been collected in June and July. They are predominantly nocturnal and come to lights. They have been collected while seeking nectar on the flowers of bearberry (Arctostaphylos uva-ursae) in central Yukon Territory.